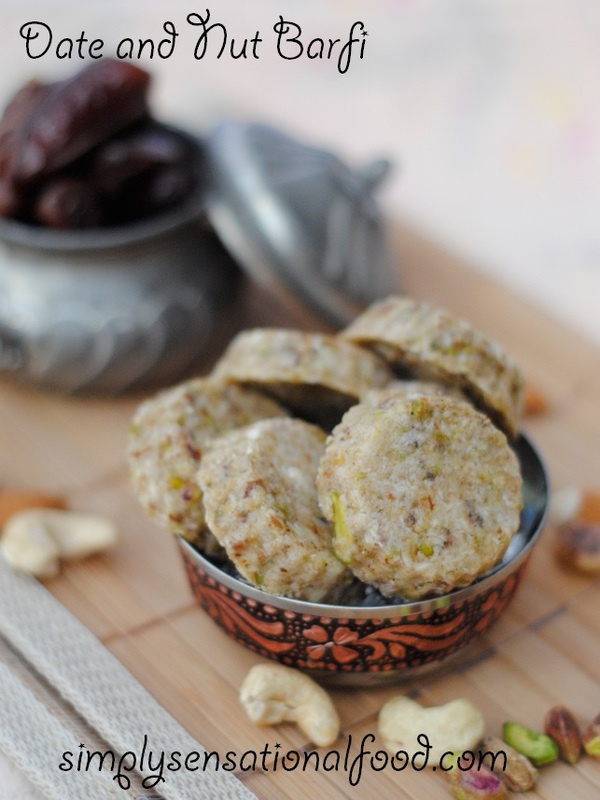 A healthy and delicious treat perfect to serve as a snack or after dinner treat. 1. Remove the stones from the dates and chop finely. Place the dates in a bowl and add 60 ml boiling water and the saffron strands and leave from 1 hour. 2. In a coffee grinder coarsely grind the pistachio nuts, cashew nuts and almonds. 3. In a large bowl mix together the coarsely ground nuts, dessicated coconut, sugar, cardamom powder. 4. Using the back of a spoon mash together the soaked dates. Add the soaked dates to the nut mixture a little at a time until all the ingredients are combined. Mixture should not be too wet and if made into balls should retain shape. 5. Pinch small walnut sized balls of the mixture and push them into silicon chocolate moulds to shape them. 6. Once all the mixture is shaped in the moulds place the tray in the fridge to chill for 1 hour. 7. De mould the barfi and keep refrigerated . 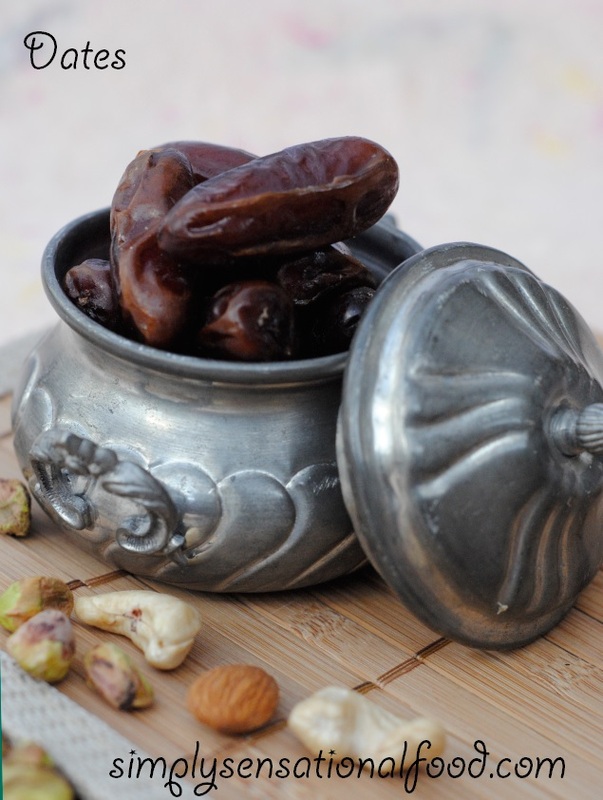 Dates and nuts - two of my favourite foods! I'll have to try this. I hope you do Karen do let me know how you enjoyed them. These look amazing and easy too! Wonderfully photographed! What happens if you DON'T keep them in the fridge? I'm always looking for easy, yummy, PACKED with goodness snacks for hiking. Kimberley, since I didn't cook the datesin the water, I am not sure of the shelf life of these long term.If you want these to travel it would be best not to soak the dates in water instead grind them to a pulp and add a sponful of honey to the mixture to bind it. they will keep without any problem. This, once again looks lovely. I'm not a fan of dates but I'd still like to try it! Hollie replace the dates with prunes or dried apricots instead. Those look quite yummy, I love eating nutty things. Oh wow - looks amazing! I love your dishes - where are they from!? Very healthy and they look tasty. An intriguing mix of nuts and spices - this would make a great energy snack! Seeing dates in the title put me off, but as you can't really see them in the end maybe this could be a cunning plan to encourage me to eat more fruit, I love nuts so that bit works for me. Kate replace the dates with dried apricots or prunes instead. On the lookout for snacks that are also healthy, or at least not unhealhty. A really easy recipe. Looks so good! I love date and nuts, I got a grinder for Christmas, that I haven't used yet so I will give this a try. I am sure you will love this its so easy to make and delicious. This looks really interesting and your photography is stunning! I sometimes see these indian sweets for sale in drummond street, very yummy looking and almost healthy! Fiona, this is my take on a healthy version very little sugar and no clarified butter which is the main ingredient in Indian sweets. my mum makes badam burfi.... and i always love it !! your pics are spell bound... ! Thankyou Sandya so pleased to see you dropped by here.Welcome back. Yummy, I love dates and this looks delicious as well as healthy. Gorgeous photos, too. Thanks for sharing. I look forward to exploring some of your other recipes during the Ultimate Blog Challenge. I look forward to your visits Minette. @ Scott Barfi is a traditional name name given to any indian fudge type of sweet. they sound delicious, but I recently developed a nut allergy. Such a shame! I love nute, these look lovely, mine probably wouldn't come out as good as yours look! That sounds absolutely delicious! Will bookmark it and give it a go! I love barfi of any kind this looks goregous! Mmmmm . . . looks good. I'll need to try this out! Looks delicious! Thank you for sharing. Your photos really enhance the posting- well done! Gorgeous! Will have to try these! These look both healthy and tasty. Fab Nayna. My first ever batch of barfi didn't set, been scared to make since but I absolutely love the combination you have in yours, sounds yum!! Must try this, I love dates and nuts, though not so sure about the cardamon. I love dates. Your biscuits look so crumbly and vulnerable and just screeming to be eaten slowly and savour each bite! These sound delicious. I always find if you have unusual snacks in the fridge you tend to appreciate them more and eat less. I'll be giving these a go. They sound tasty and healthy! They look lovely but I'm not a fan of nuts or dates. The kids and husband would probably love them though! Oh wow! These look amazing, and the ingredients definitely get the thumbs up. I love dates, that sounds divine. That's definitely my sort of thing! Do you use cardamom powder or do you powder it yourself? I've read that cardamom loses its flavor very easily in powder form! 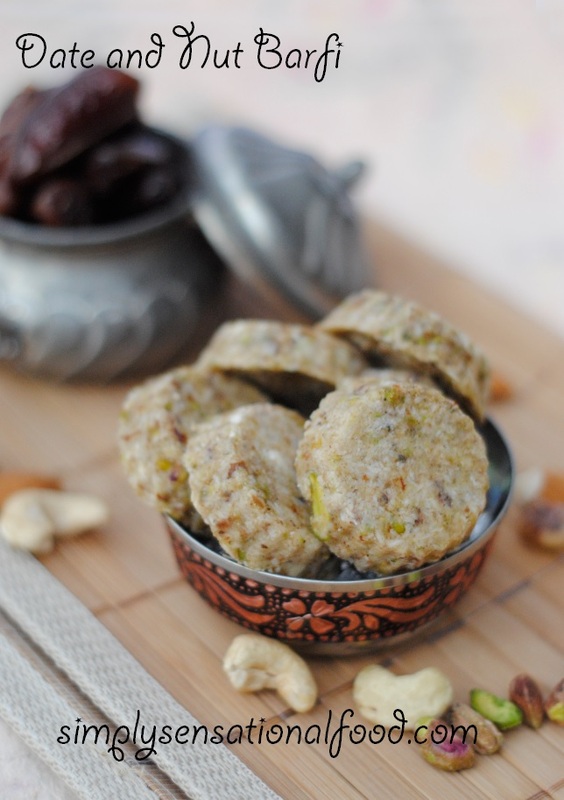 I love dates so it's perfect snack for me ;) I only had mango and pistachio barfi.